Ayurveda aims at uprooting the main cause of the disease and its lifetime cure through a proper diet and disciplined lifestyle. Ayurveda, an ancient discipline of medical sciences, evolved in India during Vedic period.The busy and mechanical lifestyles of the people nowadays have increased the popularity of Ayurveda Tours as one of the theme travel tours in India. This in turn has shooted up the graph of tourists coming for the Ayurveda Tours in India. Many Ayurveda resorts have been set up in India, concentrated mainly in the states of Goa, Kerala, Karnataka and Rajasthan to offer destinations for these Ayurveda tours, the theme travel tour in India. Most of the Ayurveda tours are conducted in India in Soomatheeram Beach Resort, Manaltheeram Health Resort and Hotel Swagath Holiday in Kovalam; Hotel Aquaserene in Kollam; Fort Palace Devigarh in Udaipur; Kumarakom Lake Resort in Kumarakom; Club Mahindra Lakeview Resort in Munnar; Taj Holiday Village and the Marriott Resort in Goa and the Taj Malabar in Kochi. A few Spa Resorts in India supplement these Ayurveda resorts. The most popular Spa resorts are Ananda Spa Resort in Rishikesh; Golden Palms Spa and Resorts and Angsana Spa in Bangalore. On the basis of the individual's constitution, these Ayurveda resorts and Spa resorts offer a treatment out of the five basic Ayurvedic Medications namely: Panch Karma, Herbal treatment, Yoga, Meditation and Rejuvenation Therapy. 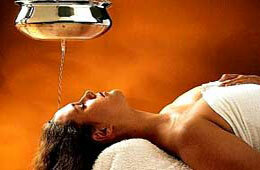 The Aromatherapy and Physiotherapy are also included in some treatments during these Ayurveda tours in India.